Are lax Texas regulations creating the new ghost towns of this era? The Calhoun County Port is located an hour southeast of Victoria, Texas, and across the bay from Port Lavaca, in Point Comfort. In March, I took a trip to this port city and was astonished by some of the issues I found there. The port has submitted documents to TCEQ for operating a bulk material handling dock. Our coalition was told it will be used for coal imports, most likely for the plants there. The permit application allows for the handling of coal and petcoke. The main facilities there are Alcoa and Formosa plants for plastics. I first noticed the lack of wildlife near the site. On the Port Lavaca side of the bridge over the bay there are seagulls flying around, but in Point Comfort I did not see any wildlife. No birds, insects, or even squirrels. There was a deathly silence surrounding the area, broken only by the whirring of port-related trucks. No one was fishing on the Point Comfort side of the bridge, while the Port Lavaca side was bustling with people fishing on piers. On Texas 35 I saw a large elevated area that I first assumed would be used for a landfill. There were Caterpillar bulldozers pushing around dirt up a 15 foot tall, mile-wide manmade hill. However, it may also be a site of the coal import facility since it is right next to a ship dock. 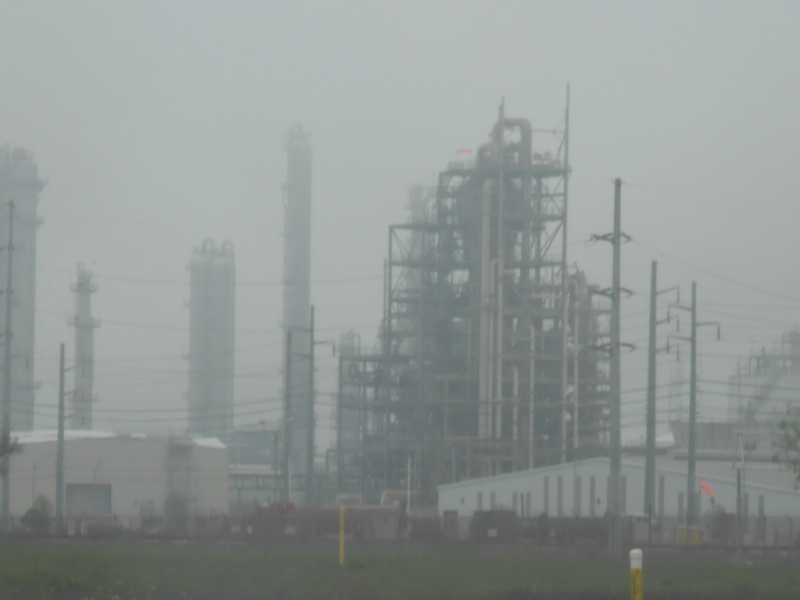 I drove further and saw many TCEQ air quality permit signs, including for the Formosa plastics plant. Some of the plants with TCEQ air quality permit signs were emitting some kind of steam. At the end of the road was a large chute with huge piles of bauxite, the ore from which aluminum is made. The residential areas were empty and had very few cars in front of them. I wasn’t sure if that was because few people in the area had cars, but later on I was told that a lot of the residents died of cancer or the houses were condemned. There were playgrounds right next to the plastics plant, but it is doubtful that Point Comfort was an area with a lot of children. At the gas station as I was leaving I picked up a copy of the local newspaper, the Port Lavaca Wave. On the front page was a news story about how Point Comfort was getting one more police officer in addition to the sheriff because the plant workers were driving too fast. On a hunch I decided to look into the crime rate in the area and found something shocking. There is a correlation between lead exposure and violent crime. The violent crime rate in Port Lavaca is extremely high for a municipality of its size (11,405). The violent crime rates are comparable to mid-sized cities like El Paso that are many times larger than Port Lavaca. What I saw there was straight out of a nightmare, the result of when too little regulation and overpowering industry meet residential areas. However, workers aren’t safe either, as there was a recent fire that resulted in injuries at the Formosa plant there. These horrific industrial areas are not limited to isolated areas where people move out. This is a common theme across the Gulf Coast in more populated areas like Plaquemines Parish near New Orleans, LA and Houston, TX. In the face of disasters like the one in West, TX issues like these need to be raised to policymakers and community leaders to prevent the deaths of both persons and communities.